Born in Campobasso, he graduated in Industrial Design at the Milan Polytechnic. From 2000, he started cooperating with several architects and designers in Milan, where he was involved in furnishing, complements, out-fitting and graphics, developing the design of new chairs, complements for living, sofas and lights for many Italian and foreign companies. In 2007 he opened his Studio in Milan, focusing in industrial design and started his cooperation with various companies. During these years he concentrates most on developing chairs, stool, armchair, sofas, tables and bookcases. His proposal is characterized by the capability of merging researched lines with formal design, which arise from the will to realize simple pleasant and functional products, in which all details take on essential value in defining the meaning of the product. 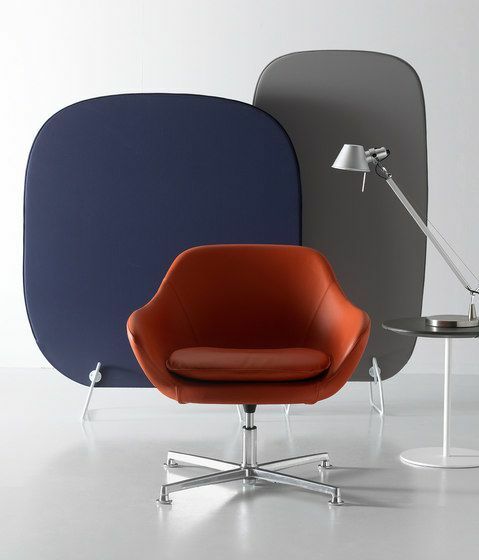 Manta holds in its soft and essential shapes the essence of a lounge chair. The armchair, is characterized by the rounded shapes, which gives in the office, residential and contract environment a comfortable and closed space, as well. The rod framework is made of a 12mm diameter metal steel tube, available in black matt finish or chromed and always equipped with adjustable steel feet. The wooden frame of the armchair has soft shapes and is perfectly fastened to the shell. It is made of solid oak wood and is available in natural or moka finish, while the shell is in cold injected poluyrethane foam. The cushion is standard in polyurethane and memory padding and can be easily changed in the “soft” and quilted version with a shellshaped. Manta is also available with a swivel die-cast aluminum 4 races base, diameter 70mm and return mechanism. The versatile framework (available in black matt finish or chromed), performs waiting tables with a thermothreated oak finish top, that are able to perfectly integrate with all version of Manta armchair and cause modern and incisive furniture solutions.